Thanks to Ig-Roid’s occasional Star Spot feature (a questionnaire for contributors to 2000 AD), I learn that John Wagner is the same age then (1991) as I am now (2008). It makes you think that by the time Wagner is my age he’s already created Judge Dredd and written (or co-written) such classics as The Day the Law Died, The Judge Child Quest and The Apocalypse War. He’s also created and moved on from Strontium Dog and Sam Slade Robo-Hunter. Still, on the plus side, he has The Pit, Button Man, A History of Violence and that excellent Bat Man story serialised in Legends of the Dark Knight yet to come. Not so long ago, thanks to the same feature, I discovered that Ron Smith was born in 1926. This means in that in 1991 he is 64, which means he has always been much older than his collaborators on his work throughout his time at 2000 AD. It was pretty obvious from elements of his art style that he was older but there has always been a tone to his work that complimented the young and subversive attitude of the comic. It also means that today, in 2008, he is 82 years old. I hope he is well and enjoys good health. CHRISTMAS UPDATES: You may have noticed that my Slog commitments have been ebbing during December. So, I’ve decided to take a proper break from 2000 AD over Christmas week until the New Year. Please report back around New Years Eve or Day for my end of year review followed by a return to more reliable entries. There was a time in Judge Dredd and associated strips that when a character appeared, no matter how strong and popular they might be, it was for just the once, for the duration of the story, before they disappeared. Often they were killed off so that John Wagner wasn’t tempted to use them again. How unlike American comics, who I was more familiar with, this was. Characters appeared again and again and again there. Hell, they even appeared in comics that they weren’t even originally meant for. These days, Wagner is willing to revisit characters he had done away with in the past and thank God for that. In Mean Machine Travels With Muh Shrink, the head butting nut job from the Angel gang overcomes his short lived rehabilitation, kidnaps his psychiatrist and time-jacks a time machine. Unfortunately, Mean is lacking any real imagination so doesn’t go anywhere particularly exciting but fortunately he’s bright enough to know this so it isn’t before long he is reunited with his violently crazy family who Judge Dredd killed years ago during The Judge Child Quest. Wagner is on absolutely form here. Travels With Muh Shrink contains all of the farce, satire and cruelty that you might associate with the best his humour strips. He seems to know the Angel Gang almost intimately and writes their dialogue with absolute precision. Richard Dolan’s oil painted art is unquestionably excellent. It’s lovely to look at but manages to tell the story perfectly. Unfortunately, like Carl Critchlow recently on Nemesis and Deadlock, the reproduction is murky and the result is disappointingly dark. The real disappointing thing about Travels With Muh Shrink, however, is that it is only seven episodes long. 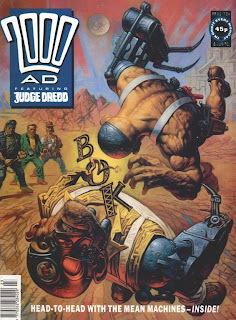 Although, I suppose we should be pleased that it appears in 2000 AD at all and not the arguably more appropriate Judge Dredd The Megazine. After years in the wilderness, Sam Slade Robo-Hunter is back! In this new twelve parter, up to its penultimate episode this prog, a computer virus is playing havoc with the robots circuits and causing human carnage throughout the city. Most of the Robo-Hunters have been killed and all that is left is young Gaz, a Two Tone music loving throw back to the twentieth centaury, and Sam, now an ice cream man. On top of that, a Terminator styled police officer has learned that he is a cyborg, realised that his entire life is a lie and gone on a murder spree like you do. Let’s get the art out of the way first. I like it. Sure, it’s not Ian Gibson but you would have to be the Fault Finder General to criticise father/son team the Joses Casanovas because they’re the wrong person. Their work here has what I think of as a classic 2000 AD tone to it; a pre-prog 500 feel but with the benefit of full colour and strong reproduction. Now let’s talk about what fresh faced writer Mark Millar has done. First, for the record, I have to state that I have been enjoying Mark Millar’s work for a long time. 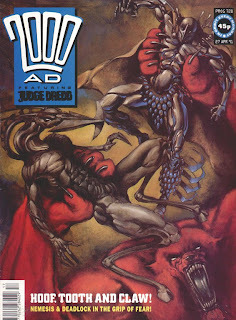 It dates back to before his 2000 AD stuff to the British indie published Saviour; the series which cast Jonathon Ross as Satan decades before The Mail on Sunday did the same thing more successfully. Like Steve Dillon before him, I was confused by what seemed to take Tharg so long to offer him work. So, you can probably imagine that when I saw that he was the new writer on Sam Slade, I was open to the idea. Unfortunately, I was disappointed then and it’s only the passage of time and this second look that allows me perhaps an insight into why it might have failed. Millar writes what would have been a fine story had the character and world been his own creation. Unfortunately, the strip carries with it the weight of what came before, even more so than other recent reinventions like Harlem Heroes and Rogue Trooper. It lacks the dynamics, humour and the basic language that made it so successful before. For example, comedy side-kicks Hoagy and Stogie barely appear in it but when they do they are vicious killing machines baying for Sam’s blood. More broadly, there seems to be a lack of robots in general which, given the name of the strip, is confusing. Before, when it was by Wagner, Grant and Gibson, the panel borders were bursting with quirky robot characters making walk-on appearances and disrupting Sam’s day to day life. I have a couple of possible explanations as for why Millar misinterpreted the strip. Apparently, he was never a reader of 2000 AD when he was growing up which explains why his feel for Sam Slade isn’t instinctive. 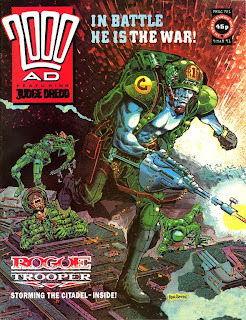 It could also be that he, being the new boy and keen for the work, is under direction from Tharg to “darken” the tone which explains Hoagy and Stogie being played as sadists in the same way that Rogue Trooper’s equipment no longer talks to him. Whatever the reason, Millar’s version is a damn sight better than Fleisher’s reinventions of classic 2000 AD characters and doesn’t inflame in me anything close to the hatred many Squaxx Dek Thargo feel towards it. In fact, this time around, expecting to be disappointed by it, I found, dare I say it, that I almost liked it. Garth Ennis’ run on Judge Dredd continues with Emerald Isle, which reaches its penultimate episode this prog. Ireland in the twenty-first centaury is now a giant Irish theme park and a group of previously harmless activists called The Sons of Erin don’t like that. The problem is that they’ve been infiltrated by a Mega-City hit-man who has persuaded them that they can only hope to achieve their aims by violent means. For diplomatic reasons, Dredd has been sent to help the Irish judges with the investigation. I’ve commented here before on how increasing the number of international judges, something that is being done often at this time, compromises the impact of Mega City One’s post apocalyptic isolation. I’ve also remarked on how, ultimately, I found Ennis’ time on Judge Dredd disappointing. However, I remember enjoying this story. 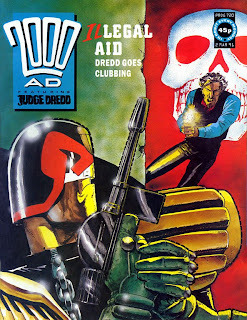 I felt at the time that, in spirit, it was more successful as a Dredd yarn than the previous Hunters Club which was a revisit to an old episode. Emerald Isle has original ideas and a more successful sense of satire. I particularly like the Spud Gun shifting its ammunition between Roast Potatoes, Chips and Mash the same way the judges’ lawgiver switches between its various bullets. I also like the art by Steve Dillon with colour by Wendy Simpson. Recently, Dillon has been prolific at the expense of quality whilst his team-up on Harlem Heroes with inker Kevin Walker proved disappointing in the end. On Emerald Isle, it looks like a return to form thanks partly to Simpson’s wonderful paint washes. There seems to have been a number of short run serials recently. I blame the increase in the colour page count increasing the length of time it takes for a story to be completed. Finishing this prog is Nemesis and Deadlock: The Enigmass Variations. In it, Nemesis and Deadlock (obviously), now that it is established that they are both warlocks and share the same universe, attend a sorcerers’ convention together. It turns into a murder mystery of sorts when a demon is set lose and the cast try to work out who is responsible for it before they all die. It’s been an okay little yarn, I suppose. More like a fun filler between epics rather than a thrilling team-up in its own right. Carl Critchlow’s painted art is accomplished but the reproduction, even on this improved whiter paper, is often murky and difficult to decipher. The story itself, written jointly by Pat Mills and who I think of as his apprentice Tony Skinner, has often felt like two people interested in magic sharing an in-joke. The Enigmass Variations has been an improvement on recent Nemesis stories but it still feels like there is some way to go before a full return to form. Bix Barton’s latest ridiculous adventure, Carry On Barton, hits its penultimate episode this prog. Bix stories never run for very long, unfortunately, although, by Bix standards, six weeks is quite a length. In it, he is tasked with protecting three members of the aristocracy from the Carry On Club, other members of the upper class elite who like the Carry On films so much that they’ve even gone through cosmetic surgery to look like their favourite cast members. Basically, it’s a device to create a story where late comedy actors go on a murder spree. It’s 1991 and the Carry On films are going through a period of ironic appreciation which started with students and has now reached the mainstream. It has already hit 2000 AD. 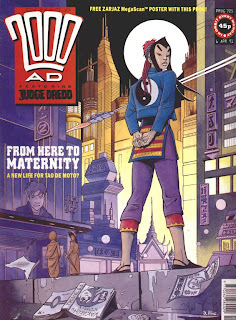 Last years Judge Dredd Mega-Special featured a strip called Carry On Judging. I would say, of the two, Carry On Barton seems to be more successful as a pastiche, if in a sick way. Personally, I find the fondness some people have for Carry On films a little misguided. I generally suspect, in fact, that the British public find the sight of elderly men lusting over very young women troubling, the jokes, in general, to be pathetic and Barbara Windsor’s bra pinging off across the camp site surprisingly sexless. Come on, admit it, whenever you read every few years of a new Carry On film is being made by the current wave of populist comedians, your heart sinks. It’s interesting for me to see how two premier league comic creators of 2008 are being perceived in 1991. 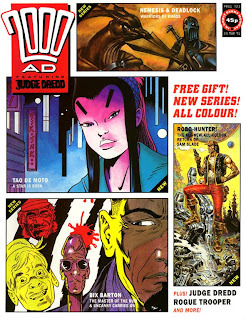 Today, Dave Hine is a comic writer but, during this time at 2000 AD, he’s the artist on Tao De Moto. Hine’s art here, in case you haven’t seen it, has a contemporary and confident feel to it. I think comics are genuinely missing out by not seeing him both write and draw his own work any more. One of the stories about writer Mark Millar is that he wrote a script a day for six months until he started to successfully get work. This might explain why Ig-Roid feels that Millar has been around long enough for the entire first page of this prog’s Nerve Centre to be dedicated to him when he’s new to us, the loyal Squaxx Dek Thargo. It’s entertaining to see that Millar has the same sense of self promotion in 1991 as he does in 2008. When asked about his other current work in the questionnaire, he lists a bunch of projects, including Dr Paradox and The Sacred Skin of Sherlock Holmes, half of which never got to print as far as I am aware. There’s nothing quite like a re-launch prog. This issue is the ideal jumping on point for new readers and returning old readers as all the stories are first episodes… except for Rogue Trooper which runs the last part of The Golden Fox Rebellion. Any new readers won’t be particularly interested in what is going on there but, you know, neither are the rest of us. 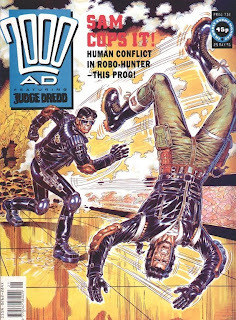 This prog’s notable first is Mark Millar’s controversial run on Sam Slade Robo-Hunter. It’s a little too early for me to comment on just yet although I will say that if you can’t get Ian Gibson to draw it then Jose Casanovas is an acceptable replacement. The colour page count has increased to 100 % which considering there has been no price increase is pretty good, I would say. In fact, since prog 700, that turbulent three year period of change the comic seemed to be going through looks like it might be over. 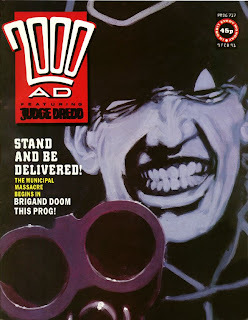 Visually, 2000 AD has a healthy mix of fresh new talent such as Dave Hine, old school guys, such as Ron Smith, and Europe based artists, such as Vanyo. Overall, it has a better sense of what it is these days with the majority of creators pulling in a similar direction. In fact, tonally, I would say it has more in common with pre-prog 500 but with improved reproduction. Of course, let’s see how long Tharg keeps it up for. Rogue Trooper’s first big story since the album driven opening reaches part 10 this prog. Normally, if you’re a regular visitor to The Slog you will know, I like to do a little summary of what the story is that I’m referring to but in the case of The Golden Fox Rebellion I’m not entirely sure that there is one. Friday (that’s the name Rogue is known by these days) aligns himself with a group of soldiers against another group who are holed up in a fortress of some kind. As Rogue Trooper for the nineties seems to have dispensed with the idea of sides representing good (the South) and bad (the Norts) Friday’s decision as to who he teams-up with has been motivated entirely by Gaia, the only woman on the planet apparently, being amongst them which, now that I think about it, probably makes a lot more sense. Shame she got killed off a couple of episodes ago. Given that I despised his reinvention of The Harlem Heroes but thought his stories for the Annual seemed okay, it’s a shame that Michael Fleisher has fumbled this opportunity to redeem himself by writing a Rogue Trooper story that I don’t find the least bit compelling. On the other hand, Ron Smith’s art is superb. It’s actually great to see him working on a character other than Judge Dredd and I love his pallet’s bias for yellows and lilacs. 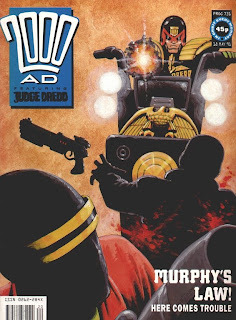 I was looking forward to writing all about Garth Ennis’ first Judge Dredd story, Death Aid, but five episodes in and it went on an “interlude”. That’s what happens when you get Carlos Ezquerra to draw a multi parter, even a short one, so soon after completing thirty weeks of consecutive artwork on Necropolis. The bones in the poor bloke’s drawing hand must have turned to dust after that. The one-offs that filled the space until Death Aid’s return this prog were all written by John Wagner which must be a little intimidating to Ennis whose big Dredd premier is not only failing to appear in one single lump but the fillers in between were also written by the master. So far, these single episode interludes have had a grim quality to them. In one, two sisters kill people for their body parts in an insane attempt to rebuild their father who they had to eat during Necropolis. Wagner seems to want to deal with the idea of city wide trauma in Judge Dredd but thanks to the increase in the quantity of Dredd stories recently and the number of contributors to the growing fictionalised world (see The Megazine) it’s all getting spread a bit thin. As for Death Aid, it’s a confidant premier for Ennis. He seems to have the speech patterns, the characterisation and the tone of the strip cracked. My memory of his time on Dredd is that, overall, it was disappointing but re-encountering this story for The Slog contradicts that. It doesn’t, however, contradict the sense I have carried over from first time around of him mainly revisiting ideas devised by Wagner and Grant (in this case, writing a sequel to The Hunters’ Club story). I suppose that The Slog will tell if that one’s true. Thanks in part to the letters page now appearing after all the strips, I find myself reading less printed correspondence from the Squaxx Dek Thargo. I still, however read Tharg’s editorial and, I have to day, he seems to be losing touch with his readers increasingly with each passing week. Maybe Ig-Roid has taken the wind out of his sales now that he has been tasked with writing about droid appearances and sister publications leaving Tharg with little else to talk about. This prog, Tharg rattles on about a rave organiser who has used, on occasion, the 2000 AD logo and, Grud forbid, the image of Roxilla on promotion for their events. 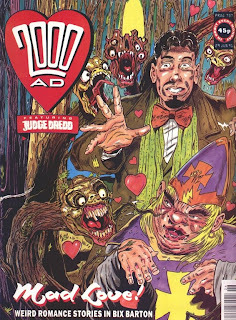 Obviously, Tharg makes it clear that 2000 AD has absolutely nothing to do with them. He’ll be telling us next that those little tabs with Dredd’s face printed on them that were on sale there are unofficial as well. I would like to suggest that the only people associated with 2000 AD who encountered this unofficial association were the current Tharg, the real Roxilla and, perhaps, script writer Alan McKenzie. Any readers who encountered it would have been old enough to understand that the use of the images was unofficial and any that did attend believing it to be real are stupid and we don’t want them associating with the rest of us anyway.